Michelle Zhang, an undergraduate student in biological and environmental engineering, and a frequent user at the CHESS Sample Environment Lab, was part of the Cornell iGEM team in this year’s competition. iGEM stands for “international Genetically Engineered Machines” and is an international student competition in the field of bioengineering. The Cornell iGEM team is a student-run synthetic biology project team comprised of over 20 undergraduates across three colleges and six majors. Each year, the team tackles relevant problems in the local community, and for 2015, the team looked into Bacterial Cold Water Disease (BCWD) — a fatal skin-lesion disease in salmonids caused by bacterial infection that is persistent in the aquaculture industry. Through collaborations with local fish hatcheries and biological field stations, iGEM members learned more about BCWD and attempted to optimize a recently discovered nonantibiotic treatment option. Antimicrobial peptides called entericidins have been shown to protect salmon from BCWD. The team bioengineered 20 isoforms of entericidin using E. coli for expression and tested the effectiveness of the strains. The peptides were integrated into a gel to treat BCWD directly at the site of the infection. The team also developed a novel time-based drug delivery system by altering currently used fish tags and drafted a preliminary business plan to bring prototypes to hatcheries around Cornell. Their project fishPHARM achieved international recognition at the iGEM Giant Jamboree in Boston in September 2015 and was awarded with Best Environmental Project, Best Supporting Entrepreneurship, and Best Applied Design. We congratulate Michelle and her team members on their great success! 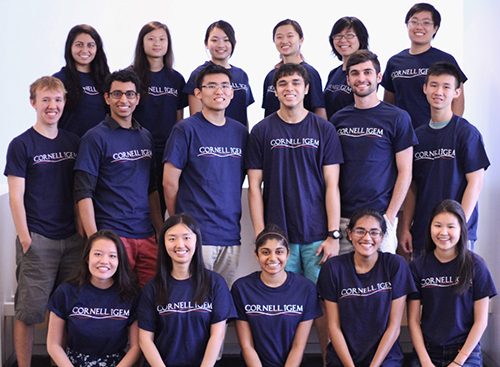 The 2015 Cornell iGEM team. Michelle is the second from the right in the top row. 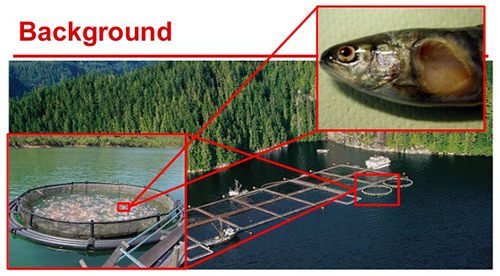 Salmonid affected by Cold Water Bacterial Disease, as often found in fish farms.